Happy Tolkien-Reading day, everyone. I grew up with The Hobbit, and later, LOTR, so I'd be forgiven to think of JRR Tolkien as the "Old Guard" of fantasy literature. It's easy to forget that he was breaking new ground. He pulled a lot of his inspiration out of mythology and "faerie stories." of northern Europe. Until Tolkien, stories involving Elves, Goblins, and Trolls were considered solely the purview of children. They were often made with obvious and heavy handed morals aimed at kids who presumably were expected either not to notice or not to mind that they were being lectured. The work of George MacDonald comes to mind, and Tolkien's contemporary, C.S. Lewis had no shortage of Christian (and racial) allegories in his work. The degree to which you can read morals into Tolkien's work is still hotly debated, but there's little argument that it was written at a higher level than the others. The complexity of the story lines and background of the world is far higher. Tolkien didn't think that fairy-stories were just for kids. I think there's something we can take from this today. Here's an excerpt from the appendix of Tales from the Perilous Realm, with Tolkien making his point. I updated it a bit by doing a find a replace. I think the point still holds. It is usually assumed that children are the natural or the specially appropriate audience for fairypony-stories. In describing a fairypony-story which they think adults might possibly read for their own entertainment, reviewers frequently indulge in such waggeries as: “this book is for children from the ages of six to sixty.” But I have never yet seen the puff of a new motor-model that began thus: “this toy will amuse infants from seventeen to seventy”; though that to my mind would be much more appropriate. Is there any essential connexion between children and fairypony-stories? Is there any call for comment, if an adult reads them for himself? Reads them as tales, that is, not studies them as curios. Adults are allowed to collect and study anything, even old theatre programmes or paper bags. 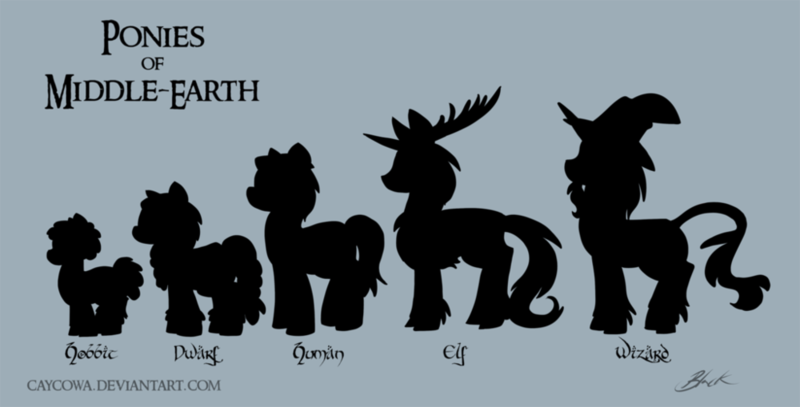 The Ponies of Middle-Earth, via Caycowa.